We have a Panafax UF580 fax machine. I just wanted to make sure that if I order a cartridge it will fit the UF-585 / 595 printers and that it will also fit the UF580 fax machine? Yours faithfully, Lucy Ettinger. 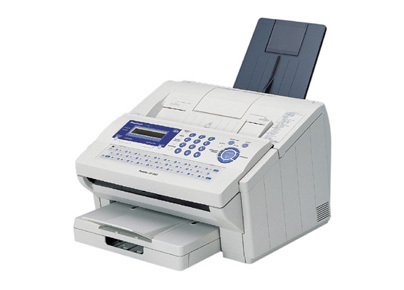 The Panasonic UF-580 fax machine uses the same toner cartridges as the Panasonic UF-585 and UF-595 printers. The genuine or compatible Panasonic UG-3350 and UG-3380 black toner cartridges listed on this page for use in the Panasonic UF-580 printer will also work in the UF-585 and UF-595 printer models. Simply click on any of the cartridges to bring up a full list of compatible printers displayed under the heading "This item is guaranteed to work in the following printers:"
Users that need high-quality and professional output turn to the Panasonic Panafax UF-580, a multifunction colour printer with a speedy laser print engine and time-saving benefits to help improve productivity. Unlike other standard all-in-one devices, it offers a reliable fax feature and versatile media handling, plus an automatic document feeder to aid in multi-tasking. Unfortunately, the Panasonic UF-580 laser printer is an overpriced, heavy and bulky device. This all-in-one combines a fax machine, digital copier, and a versatile flatbed scanner with a colour laser printer. The Panasonic Panafax UF-580 laser fax machine features a simple frame with a busy control panel and a 50-sheet auto document feeder on top. The entire device measures 520mm wide, and it is quite tall at 546mm, while being 438mm in diameter. The main paper tray is good for 250 sheets, while the larger colour display screen displays 2 lines and 16 digits. There is 192MB of allotted memory for the Panafax UF-580 multifunction printer. The 33.6Kbps fax machine of the Panasonic Panafax UF-580 laser fax printer is compatible with super G3 technology and the 9600dpi scanner can scan directly to FTP or an SD card. The copier and printer are fairly fast, at up to 20ppm in either colour or monochrome, with print resolutions of up to 1200x1200dpi. The display screen of the Panasonic UF-580 mono laser printer is larger and easier to view. Panasonic UF-580 black toner is available in cheaper aftermarket compatible cartridges for better value. The high initial cost is among the major drawbacks of the Panasonic UF-580 Panafax. Another is the absence of full telephony features for the fax machine. There are no wireless connectivity options for the Panasonic Panafax UF580. The UF580 fax machine is also quite heavy and boxy, weighing 30Kg.